If you prefer a less sweet dessert, cut the sugar to 1/2 cup, or substitute 1/4 cup of honey. (Honey will be more likely to brown faster, so you may wish to lower the temperature 5-10 degrees.) Want a little more spice? Double up on the cinnamon, or add a little nutmeg, cardamom or ginger. 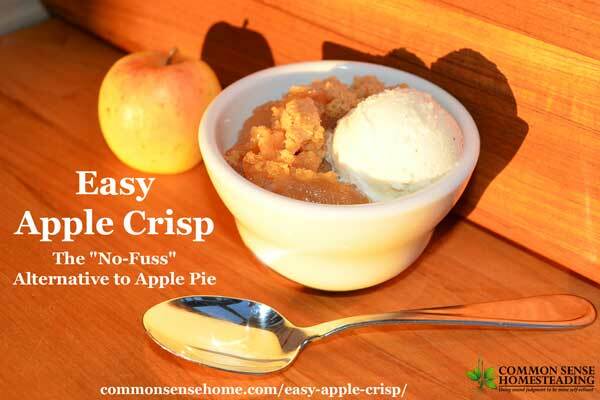 This apple crisp recipecan easily be doubled and baked in a 9×13 baking dish. 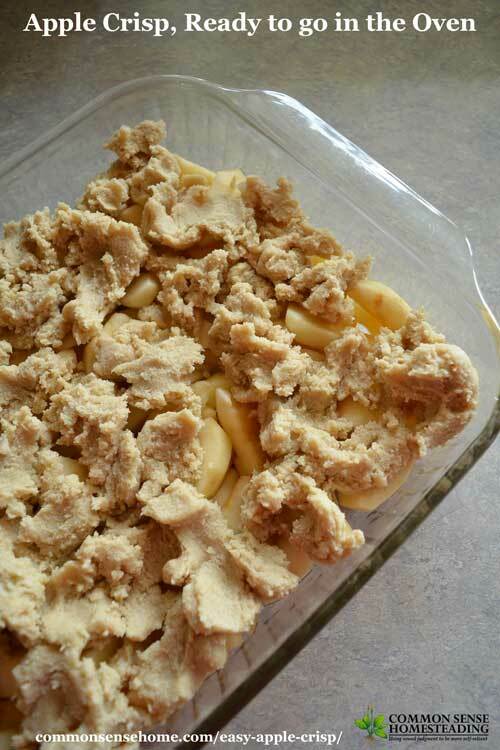 I prefer glass bakeware, if available, for slow and even cooking. To keep the apples from browning, place cut apples into cool water with lemon juice. Use about 1/4 cup lemon juice per 4-6 cups of water. You may also salt water (1 tablespoon salt per 6 cups water) or citric acid in water (1 teaspoon citric acid per 4-6 cups water). I fill my 8 cup Pyrex measuring cup about two-thirds full with lemon water, and place the apple slices in as they are prepared. Once the apples are done, I drain them and move them to the pan. Then I use the big measuring cup to mix the topping. 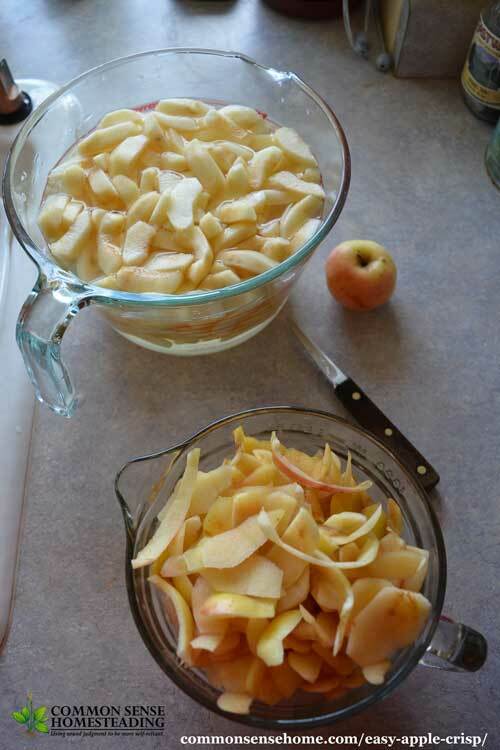 Apples for a double batch of apple crisp, plus peels saved for homemade apple cider vinegar. Arrange apples in 2 quart baking dish. Sprinkle apples with 1 tablespoon of sugar, toss to coat. Combine flour, salt, cinnamon, remaining sugar and soft butter. Mix until just blended. 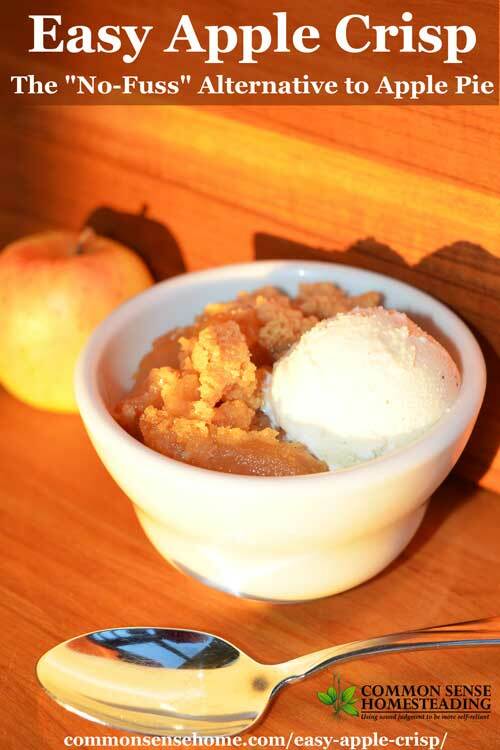 Spread crumble topping over apples, evenly distributing over entire dish. Bake at 375° F until edges are lightly brown and crisp and center is bubbling, about 50 minutes. Serve warm, with ice cream if desired. 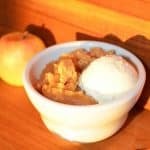 This easy apple crisp goes together in minutes to create that homemade apple pie flavor without the work. Delicious served warm with vanilla ice cream. Arrange apples in 2 quart baking dish. Sprinkle apples with 1 tablespoon of sugar, toss to coat. Combine flour, salt, cinnamon, remaining sugar and soft butter. Mix until just blended. Spread crumble topping over apples, evenly distributing over entire dish. Please tell me that the nutritional information provided is for the entire dish. Not a single serving, right? I would assume so. It’s automatically calculated by the recipe plugin, and as I didn’t specify a serving number, it would make sense that it’s for the entire dish.